The Venus flytrap (also referred to as Venus's flytrap or Venus' flytrap), Dionaea muscipula, is a carnivorous plant native to subtropical wetlands on the East Coast of the United States in North Carolina and South Carolina. It catches its prey—chiefly insects and arachnids—with a trapping structure formed by the terminal portion of each of the plant's leaves, which is triggered by tiny hairs on their inner surfaces. When an insect or spider crawling along the leaves contacts a hair, the trap closes if a different hair is contacted within twenty seconds of the first strike. The requirement of redundant triggering in this mechanism serves as a safeguard against wasting energy by trapping objects with no nutritional value. The Venus flytrap is a small plant whose structure can be described as a rosette of four to seven leaves, which arise from a short subterranean stem that is actually a bulb-like object. Each stem reaches a maximum size of about three to ten centimeters, depending on the time of year; longer leaves with robust traps are usually formed after flowering. Flytraps that have more than 7 leaves are colonies formed by rosettes that have divided beneath the ground. The leaf blade is divided into two regions: a flat, heart-shaped photosynthesis-capable petiole, and a pair of terminal lobes hinged at the midrib, forming the trap which is the true leaf. The upper surface of these lobes contains red anthocyanin pigments and its edges secrete mucilage. The lobes exhibit rapid plant movements, snapping shut when stimulated by prey. 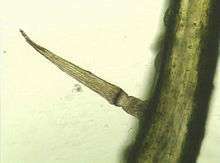 The trapping mechanism is tripped when prey contacts one of the three hair-like trichomes that are found on the upper surface of each of the lobes. The mechanism is so highly specialized that it can distinguish between living prey and non-prey stimuli, such as falling raindrops; two trigger hairs must be touched in succession within 20 seconds of each other or one hair touched twice in rapid succession, whereupon the lobes of the trap will snap shut, typically in about one-tenth of a second. The edges of the lobes are fringed by stiff hair-like protrusions or cilia, which mesh together and prevent large prey from escaping. These protrusions, and the trigger hairs (also known as sensitive hairs) are likely homologous with the tentacles found in this plant’s close relatives, the sundews. 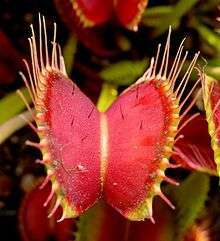 Scientists have concluded that the snap trap evolved from a fly-paper trap similar to that of Drosera. Most carnivorous plants selectively feed on specific prey. This selection is due to the available prey and the type of trap used by the organism. With the Venus flytrap, prey is limited to beetles, spiders and other crawling arthropods. In fact, the Dionaea diet is 33% ants, 30% spiders, 10% beetles, and 10% grasshoppers, with fewer than 5% flying insects. Given that Dionaea evolved from an ancestral form of Drosera (carnivorous plants that use a sticky trap instead of a snap trap) the reason for this evolutionary branching becomes clear. Whilst Drosera consume smaller, aerial insects, Dionaea consume larger terrestrial bugs. Dionaea are able to extract more nutrients from these larger bugs. This gives Dionaea an evolutionary advantage over their ancestral sticky trap form. The mechanism by which the trap snaps shut involves a complex interaction between elasticity, turgor and growth. The trap only shuts when the trigger hair is stimulated twice; this is to avoid inadvertent triggering of the mechanism by dust and other wind-borne debris. In the open, untripped state, the lobes are convex (bent outwards), but in the closed state, the lobes are concave (forming a cavity). It is the rapid flipping of this bistable state that closes the trap, but the mechanism by which this occurs is still poorly understood. When the trigger hairs are stimulated, an action potential (mostly involving calcium ions—see calcium in biology) is generated, which propagates across the lobes and stimulates cells in the lobes and in the midrib between them. It is hypothesized that there is a threshold of ion buildup for the Venus flytrap to react to stimulation. After closing, the flytrap counts additional stimulations of the trigger hairs, to five total, to start the production of digesting enzymes. The acid growth theory states that individual cells in the outer layers of the lobes and midrib rapidly move 1H+ (hydrogen ions) into their cell walls, lowering the pH and loosening the extracellular components, which allows them to swell rapidly by osmosis, thus elongating and changing the shape of the trap lobe. Alternatively, cells in the inner layers of the lobes and midrib may rapidly secrete other ions, allowing water to follow by osmosis, and the cells to collapse. Both of these mechanisms may play a role and have some experimental evidence to support them. Carnivory in plants is a very specialized form of foliar feeding, and is an adaptation found in several plants that grow in nutrient-poor soil. Carnivorous traps were naturally selected to allow these organisms to compensate for the nutrient deficiencies of their harsh environments by supplementing ordinary photosynthate with animal proteins. In 2016, a study of the expression of genes in the plant's leaves as they captured and digested prey was published in the journal, Genome Research. The gene activation observed in the leaves of the plants gives support to the hypothesis that the carnivorous mechanisms present in the flytrap are a specially adapted version of mechanisms used by non carnivorous plants to defend against herbivorous insects. In many non-carnivorous plants, jasmonic acid serves as a signaling molecule for the activation of defense mechanisms, such as the production of hydrolases, which can destroy chitin and other molecular components of insect and microbial pests. In the Venus flytrap, this same molecule has been found to be responsible for the activation of the plant's digestive glands. A few hours after the capture of prey, another set of genes is activated inside the glands, the same set of genes that is active in the roots of other plants, allowing them to absorb nutrients. 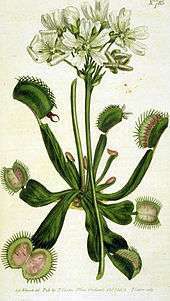 The use of similar biological pathways in the traps as non-carnivorous plants use for other purposes indicates that somewhere in its evolutionary history, the Venus flytrap repurposed these genes for the purpose of carnivory. The Venus flytrap is found in nitrogen- and phosphorus-poor environments, such as bogs and wet savannahs. Small in stature and slow-growing, the Venus flytrap tolerates fire well, and depends on periodic burning to suppress its competition. Fire suppression threatens its future in the wild. It survives in wet sandy and peaty soils. Although it has been successfully transplanted and grown in many locales around the world, it is native only to the coastal bogs of North and South Carolina in the United States, specifically within a 60-mile radius of Wilmington, North Carolina. 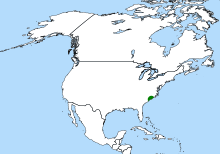 One such place is North Carolina's Green Swamp. There also appears to be a naturalized population of Venus flytraps in northern Florida as well as an introduced population in western Washington. The nutritional poverty of the soil is the reason that the plant relies on such elaborate traps: insect prey provide the nitrogen for protein formation that the soil cannot. The Venus flytrap is not a tropical plant and can tolerate mild winters. In fact, Venus flytraps that do not go through a period of winter dormancy will weaken and die after a period of time. Venus flytraps are popular as cultivated plants, but have a reputation for being difficult to grow. Successfully growing these specialized plants requires recreating a close approximation to the plant's natural habitat. Healthy Venus flytraps will produce scapes of white flowers in spring; however, many growers remove the flowering stems early (2–3 inches), as flowering consumes some of the plant's energy and thereby reduces the rate of trap production. If healthy plants are allowed to flower, successful pollination will result in seeds. In 2014, the state of North Carolina passed legislation to classify the theft of naturally growing Venus flytraps in some counties as a felony. ↑ Schlauer, J. (N.d.) Dionaea muscipula. Carnivorous Plant Database. 1 2 "Venus flytraps". The Carnivorous Plant FAQ. Retrieved 2005-06-13. 1 2 Raven, Peter H.; Evert, Ray Franklin; Eichhorn, Susan E. (2005). Biology of Plants (7th ed.). W.H. Freeman and Company. ISBN 0-7167-1007-2. 1 2 Forterre, Yoël; Skotheim, Jan M.; Dumais, Jacques; Mahadevan, L. (27 January 2005). "How the Venus flytrap snaps" (PDF). Nature. 433 (7024): 421–425. doi:10.1038/nature03185. PMID 15674293. Archived from the original (PDF) on 2 December 2007. ↑ Cameron, Kenneth M.; Wurdack, Kenneth J.; Jobson, Richard W. (2002). "Molecular evidence for the common origin of snap-traps among carnivorous plants". American Journal of Botany. 89 (9): 1503–1509. doi:10.3732/ajb.89.9.1503. PMID 21665752. 1 2 "Background Information on Venus Fly Traps—Venus Fly Trap naming and history". FlyTrapCare.com. 2008-04-04. Archived from the original on 17 December 2008. ↑ Rice, Barry (January 2007). "How did the Venus flytrap get its name?". The Carnivorous Plant FAQ. ↑ Ellison, DM; Gotelli, NJ (2009). "Energetics and the evolution of carnivorous plants—Darwin's 'Most Wonderful plants in the world'" (PDF). Experiment Botany. 60 (1): 19–42. doi:10.1093/jxb/ern179. PMID 19213724. ↑ Gibson, TC; Waller, DM (2009). "Evolving Darwin's 'most wonderful' plant: ecological steps to a snap-trap". New Phytologist. 183 (1): 575–587. doi:10.1111/j.1469-8137.2009.02935.x. PMID 19573135. ↑ Hodick, Dieter; Sievers, Andreas (1989). "The action potential of Dionaea muscipula Ellis". Planta. 174 (1): 8–18. doi:10.1007/BF00394867. ↑ Ueda, Minoru (2010). "The trap snaps shut: Researchers isolate the substance that causes venus flytraps to close". ChemBioChem. Wiley. doi:10.1002/cbic.201000392. Retrieved November 29, 2012. 1 2 Böhm, J.; Scherzer, S.; Krol, E.; Kreuzer, I.; von Meyer, K.; Lorey, C.; Mueller, T. D.; Shabala, L.; Monte, I.; Solano, R.; Al-Rasheid, K. A. S.; Rennenberg, H.; Shabala, S.; Neher, E.; Hedrich, R. (2016). "The Venus Flytrap Dionaea muscipula Counts Prey-Induced Action Potentials to Induce Sodium Uptake". Current Biology. 26: 286–295. doi:10.1016/j.cub.2015.11.057. ISSN 0960-9822. ↑ Williams, S. E. 2002. Comparative physiology of the Droseraceae sensu stricto—How do tentacles bend and traps close? Proceedings of the 4th International Carnivorous Plant Society Conference. Tokyo, Japan. pp. 77–81. ↑ Hodick, Dieter; Sievers, Andreas (1988). "On the mechanism of closure of Venus flytrap (Dionaea muscipula Ellis)". Planta. 179 (1): 32–42. doi:10.1007/BF00395768. PMID 24201419. 1 2 Bemm, Felix; Becker, Dirk; Larisch, Christina; Kreuzer, Ines; Escalante-Perez, Maria; Schulze, Waltraud X.; Ankenbrand, Markus; Weyer, Anna-Lena Van de; Krol, Elzbieta; Al-Rasheid, Khaled A.; Mithöfer, Axel; Weber, Andreas P.; Schultz, Jörg; Hedrich, Rainer (4 May 2016). "Venus flytrap carnivorous lifestyle builds on herbivore defense strategies". Genome Research. doi:10.1101/gr.202200.115. ISSN 1088-9051. Retrieved 26 May 2016. 1 2 3 Galek H, Osswald WF, Elstner EF (1990). 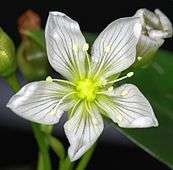 "Oxidative protein modification as predigestive mechanism of the carnivorous plant Dionaea muscipula: an hypothesis based on in vitro experiments". Free Radic Biol Med. 9 (5): 427–34. doi:10.1016/0891-5849(90)90020-J. PMID 2292436. ↑ Hsu YL, Cho CY, Kuo PL, Huang YT, Lin CC (Aug 2006). "Plumbagin (5-Hydroxy-2-methyl-1,4-naphthoquinone) Induces Apoptosis and Cell Cycle Arrest in A549 Cells through p53 Accumulation via c-Jun NH2-Terminal Kinase-Mediated Phosphorylation at Serine 15 in Vitro and in Vivo". J Pharmacol Exp Ther. 318 (2): 484–94. doi:10.1124/jpet.105.098863. PMID 16632641. ↑ Produced by Neil Lucas (2009-12-07). "Plants". Life. BBC. BBC One. ↑ AM Ellison (2006). "Nutrient limitation and stoichiometry of carnivorous plants" (PDF). Biology. 8: 740–747. doi:10.1055/s-2006-923956. 1 2 3 4 5 Gibson, T. C.; Waller, D. M. (2009). "Evolving Darwin's 'most wonderful' plant: ecological steps to a snap-trap" (PDF). New Phytologist. 183 (3): 575–587. doi:10.1111/j.1469-8137.2009.02935.x. PMID 19573135. 1 2 3 Cameron, K. M.; Wurdack, K. J.; Jobson, R. W. (2002). "Molecular evidence for the common origin of snap-traps among carnivorous plants". American Journal of Botany. 89 (9): 1503–1509. doi:10.3732/ajb.89.9.1503. PMID 21665752. ↑ Rivadavia, F.; K. Kondo; M. Kato & M. Hasebe (2003). "Phylogeny of the sundews, Drosera (Droseraceae), based on chloroplast rbcL and nuclear 18S ribosomal DNA Sequences". American Journal of Botany. 90 (1): 123–130. doi:10.3732/ajb.90.1.123. PMID 21659087. ↑ Stokstad, E. (12 May 2016). "How the Venus flytrap acquired its taste for meat". Science. 352 (6287): 756–756. doi:10.1126/science.352.6287.756. Retrieved 26 May 2016. ↑ Turner, John G.; Ellis, Christine; Devoto, Alessandra (1 May 2002). "The Jasmonate Signal Pathway". The Plant Cell. 14 (suppl 1): S153–S164. doi:10.1105/tpc.000679. ISSN 1532-298X. Retrieved 26 May 2016. 1 2 "Venus flytrap origins uncovered". BBC News. 2009. ↑ W. Schulze; E.D. Schulze; I. Schulze & R. Oren (2001). "Quantification of insect nitrogen utilization by the venus fly trap Dionaea muscipula catching prey with highly variable isotope signatures". Journal of Experimental Botany. 52 (358): 1041–1049. doi:10.1093/jexbot/52.358.1041. PMID 11432920. ↑ Schnell, D. E. (2002). Carnivorous Plants of the United States and Canada (2nd ed.). Timber Press. ISBN 0-88192-540-3. ↑ Giblin, D. Nd. Dionaea muscipula. Burke Museum of Natural History and Culture. ↑ "International Carnivorous Plant Society". Carnivorousplants.org. Retrieved 2013-08-26. ↑ Jang, Gi-Won; Kim, Kwang-Soo; Park, Ro-Dong (2003). "Micropropagation of Venus fly trap by shoot culture". Plant Cell, Tissue and Organ Culture. 72 (1): 95–98. doi:10.1023/A:1021203811457. Retrieved 19 May 2016. ↑ D'Amato, Peter (1998). The Savage Garden: Cultivating Carnivorous Plants. Berkeley, California: Ten Speed Press. ISBN 0-89815-915-6. ↑ "Venus Flytrap". National Wildlife Federation. Retrieved 2015-07-10. ↑ John R. Platt (2015-01-22). "Venus Flytraps Risk Extinction in the Wild at the Hands of Poachers". Scientific American. Retrieved 2015-07-10. ↑ "Venus Flytrap". American Cancer Society. November 2008. Retrieved 22 September 2013.